CRICKET: It was a bad omen - with Australia aiming to avoid a sixth-straight defeat in the third Test against South Africa at the Adelaide Oval, skipper Steve Smith lost his sixth toss of the coin in a row. Smith has not won one since playing New Zealand in Christchurch earlier this year - a match the Aussies won by seven wickets. It was also their last Test win. Losing the toss in Pallekele, Galle, Colombo, Perth and Hobart has been followed by a defeat each time. Another coin toss loss in the first Test against Pakistan in Brisbane on December 15 would mean Smith equals the Australian record held by Joe Darling, whose losing run lasted three years (1899-1902). Former England captain Nasser Hussain, however, holds the world record of 10 successive toss losses. It didn't seem to matter early, with the Aussies on top in the day-night dead-rubber in Adelaide. 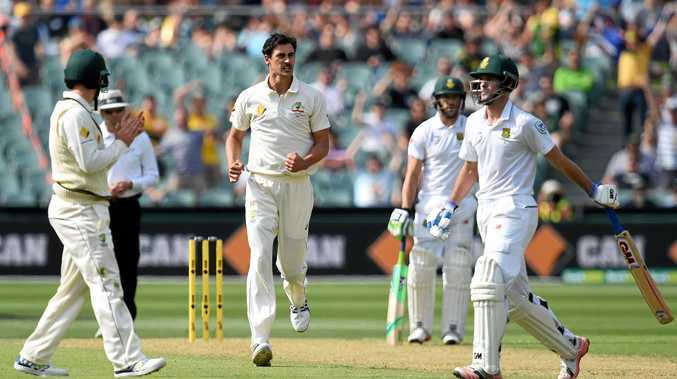 The Proteas were reeling at one stage on 3-44 as Josh Hazlewood and Mitch Starc dominated with the pink ball. Coming in at No.5, Proteas skipper Faf du Plessis copped an earful from the Adelaide crowd after being found guilty during the week of ball tampering in the second Test. With the youngest Australian Test team since 1986 at his disposal, Smith is hoping to avoid becoming the first Australian captain to suffer a whitewash in a home Test series. Queensland opening batsman Matt Renshaw, 20, made an instant impact in his debut - in the field - holding a low catch at first slip to remove Hashim Amla.